I purchased this book at Fanime 2004. 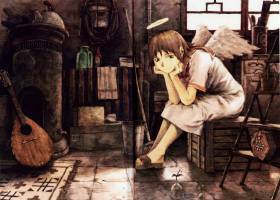 It contains plenty of sketches, and many rich, full-page color illustrations from Haibane Renmei. If you love Yoshitoshi ABe's artwork, you'll love this book. Don't settle for the thumbnails on this web page, go buy the book and treat yourself to the full-page images. All text and images on this page are Copyright © Yoshitoshi ABe. I didn't really need to read the words in an art book to enjoy the illustrations, but I wanted to read the words anyway. So I applied my limited Japanese language skills and came up with this translation. Many thanks to Keiko Czetli, my Japanese language sensei, whose patient teaching got me this far, and who directly helped me with some of the harder parts. She also teaches children at http://www.eastbaysakuragakuen.com/ . The W3C XHTML 1.1 markup tags for furigana are not supported by most browsers: Microsoft Internet Explorer displays this page's furigana above the kanji, but Safari, Opera, and Mozilla show the furigana inline, which makes the Japanese text nearly unreadable. Use the "show furigana / hide furigana" links above to… uh… show/hide the furigana. The author hopes that you will pick up this book, that this book will help you enjoy the Haibane Renmei animated show, and that Haibane Renmei becomes a special story for you. 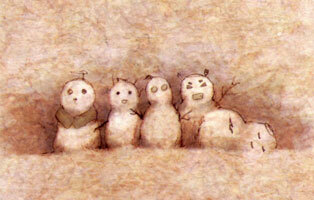 From a fluffy little seed, Haibane suddenly come into this world. Before long, the seed becomes a cocoon. Tearing through this cocoon, the Haibane is born. 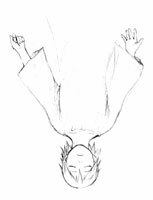 In the cocoon, Haibane have a dream. It is from this dream that Haibane get the name that they use while in this world. 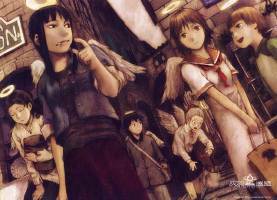 Their wings spring forth, and once the Haibane become familiar with this world, they find work. 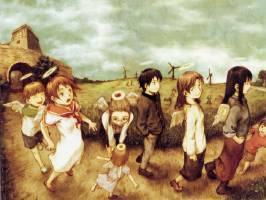 Not angels, not people, this is the life of a Haibane. And before long, the day comes when it is time to leave the nest. A girl falls headlong through charcoal-gray skies. She emerges from thick clouds as a green town spreads beneath her eyes. On the outskirts of town is "Old Home." Reki the Haibane found a large cocoon just before its hatching time. That evening, the girl born from the cocoon gets wings. Overhead, a crowning halo. Borne on her back, small charcoal-gray wings. And thus the girl comes into this world as a Haibane. "I dreamt I was in a pure white light, so I'm called Hikari (light)." "I dreamt I was drifting like a fish in a river, so I'm called Kana (river fish), ka from kawa (river), na from sakana (fish)." I have only one memory left from my cocoon dream. I dreamt of a girl falling through the sky. There's something else, too,…but I can't recall. "Welcome to our Old Home." The five of us welcome you as one of our own. Your gentle life begins here. "Kana, give me a ride!" "But it's a long way into town, geez!" 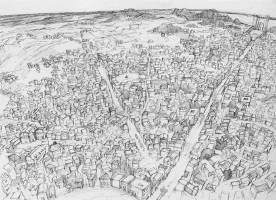 The Haibanes' nest is on the outskirts of town, so commuting to town is always a hassle. 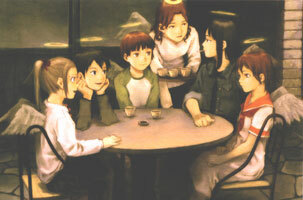 Haibane and people share the town of Guri. In town, Haibane do not pay for their things with money. They do services for the people. 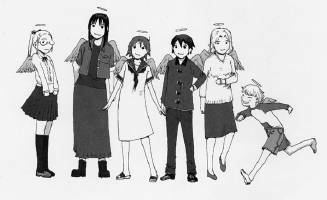 This is the life of a full-fledged Haibane. Surrounded by walls, Guri has a large gate and plaza North of the town center. 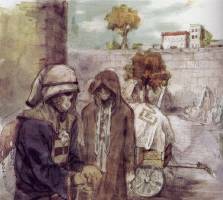 When the Toga merchant caravan turns up at this closed town, the plaza suddenly comes alive. 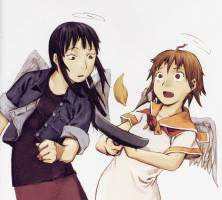 The only person who understands the Toga's difficult sign language is the Haibane Renmei Communicator. Nobody in town knows of the world outside the walls. 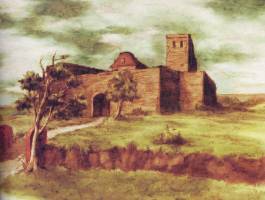 Deep inside the Western Woods sits the Temple of the Haibane Renmei, an enormous edifice made of stone. "Kindred soul Rakka, from this day forward, we accept you as one of us." I know this because there is another world that I cannot recall. "After you get accustomed to town, you need to search for work." 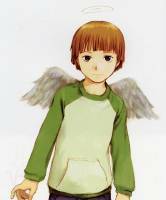 Reki's job is looking after the very young Haibane who are left in the care of Old Home. 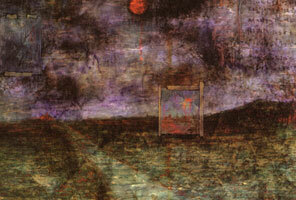 These are the dreams and the whereabouts of the Haibane that live in this town. this is their means of living in this town. Such a common sense thing, they had no knowledge of before coming here. "It's just so nice, times like this make me so happy." Once your body gets used to your wings, the discomfort passes. Dark clouds quickly pass through Summer. "My heart is like a cup"
Every day, drop by drop, my glass cup fills up a little more. "And so today, it feels like my cup became full." Suddenly, Kuu's face seemed like an adult's as her fingertips followed the raindrops on the window pane. 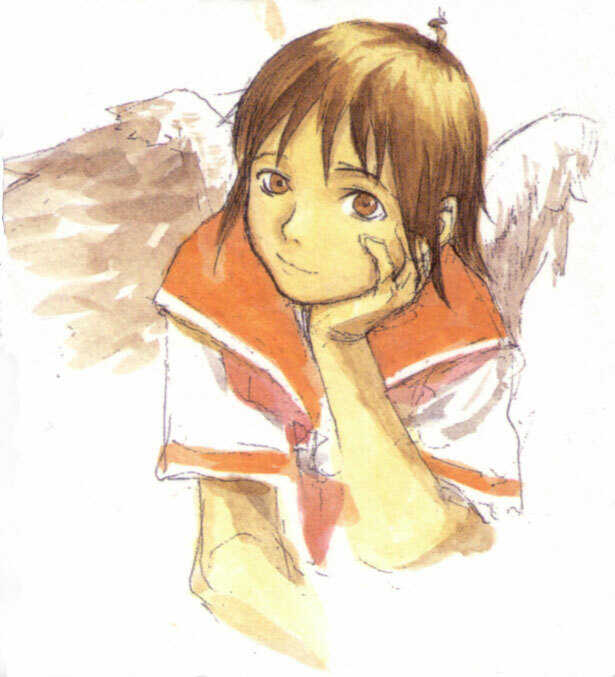 For Haibane, they look forward to the day when they leave the nest and pass over the walls, their Day of Flight. "It must be nice to really be able to fly"
"If you believe, then some day you will certainly fly." With innocent eyes, Kuu flapped her small wings. "Rakka, you also gave me some drops…. So thank you." Kuu's words filled Rakka's heart. "Everyone… eventually everyone leaves me," Reki murmurred, unheard. "I know I shouldn't cry…"
A feeble flap of wings, and a sickly feather falls to her feet. Black feathers are a sign of being "sin bound"
"Me? … Is something calling me?" I've been entrusted with this body at the the bottom of the well. 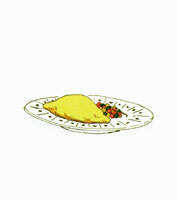 This is a message from somebody dear to to me, somebody departed! The falling snow piles up, unnoticed. "On who knows their sin is without sin. 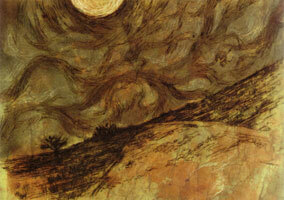 Reki, I found my dream at the bottom of the well…"
Rakka's back once again bore beautiful charcoal feathers. Her black feathers remained a secret between just the two of them. "I don't want to drag you down with me." 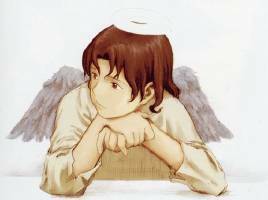 Reki's time as a Haibane was running out. She hurried off, fille with impatience and unfulfilled promise. 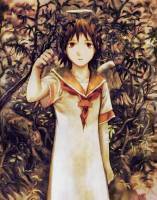 Through all her days, she has been left behind by those Haibane who had been blessed. And this year again looks to be another winter just the others. "I found your cocoon all by myself! This is certainly a special gift. This is a sign from God. I will be kind to this one. I will be together with this one for a long time. 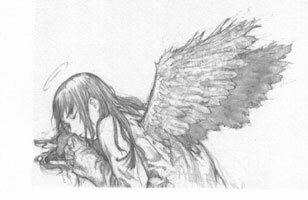 and be a good Haibane." wearing a warm smile, was calling out to Rakka. and help her towards her day of flight." "Some day, we'll see be able to each other again." hung the paintings Reki left behind. "Reki, I will never forget you." Cocoon dreams. Sin-bound. Leaving the nest. Ring of sin. Bathed in light. True names. 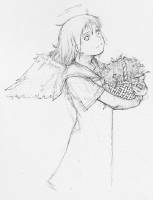 Haibane who are not blessed, without such gifts, are left behind. 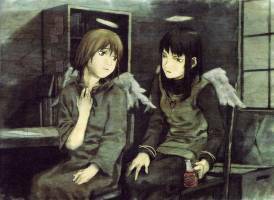 and fly over the walls that protected them while they were Haibane. Kuu, Kana, Hikari, Nemu, Reki,…and now, Rakka. They spent their days together. One by one, they will each have their day of flight. Born in Tokyo in 1971. Masters degree in painting from Tokyo University of Fine Arts. Prizewinner in "Monthly Afternoon" 1994 Four Seasons summer contest. In 1998, worked on Gamesoft's "Backloader" while in college. 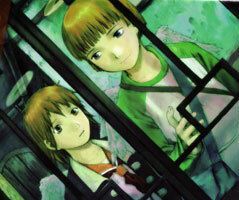 Furthermore, that same year started working on the original character design for the TV show "serial experiments lain." Published a serialized illustrated story of this same work "Omnipresence" in an anime magazine. Worked on original character designs for serialization of "NieA_7" in "Monthly S NEXT." 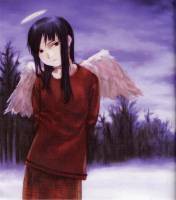 Produced the "Haibane Renmei" books and also worked on scenarios for the complete animated series. 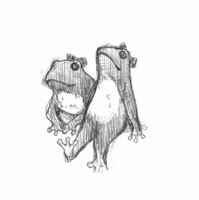 Worked as a character designer and illustrator, and displayed his talent as a storyteller. 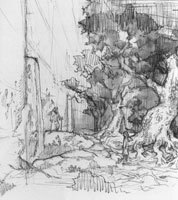 From his elaborate backgrounds that show his artistic skill and his subtle human forms come original worlds that attract numerous fans from overseas. 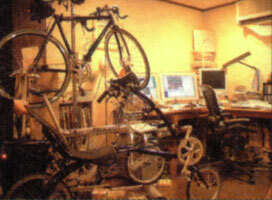 His work includes "serial experiments lain," "NieA_7," "Haibane Renmei," "TEXHNOLYZE," and more. 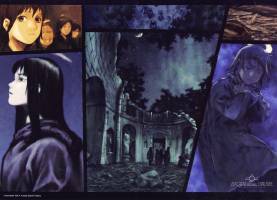 If you want to be precise, Yoshitoshi ABe started to write the plot for the story "Haibane Renmei" on May 2, 2002 or the next morning. He can still clearly recall the uplifting feeling of that time, the deep feelings as his fingertips struck the keyboard. If I recall correctly, I plunged straight to the bottom my unconsciousness, which I usually keep tightly sealed away. There I found signs which pointed me to the conclusion for this story. In one way or another, all the elements of Haibane Renmei are connected in that way. (At least to me,) I think that such a structure makes this story special.